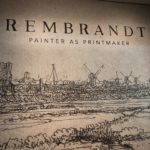 Rembrandt: Painter as Printmaker is on view through January 6, 2019 at the Denver Art Museum. Now through early next year, the Denver Art Museum is the sole U.S. venue to host Rembrandt: Painter as Printmaker. The exhibit includes nearly 100 prints from throughout Rembrandt’s 40-year career. It looks at his approach to printmaking and the evolution of his craft. It also observes how he combined the three principle methods of intaglio: etching, drypoint and engraving. On display includes several self-portraits in addition to still life, biblical, allegorical, genre and landscape pieces. While the exhibition centers on Rembrandt’s printmaking, 17 drawings and several paintings are also on view.